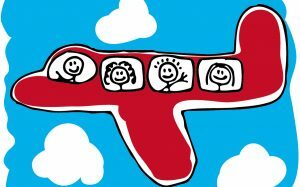 It’s the travel season and for many families with small children, that includes flying somewhere. Since so many carseats are heavy and bulky, it makes sense in some cases to invest in a lightweight carseat just for traveling. Plus, this spares you the hassle of re-installing your main carseat when you get back to your own car, weary from traveling. 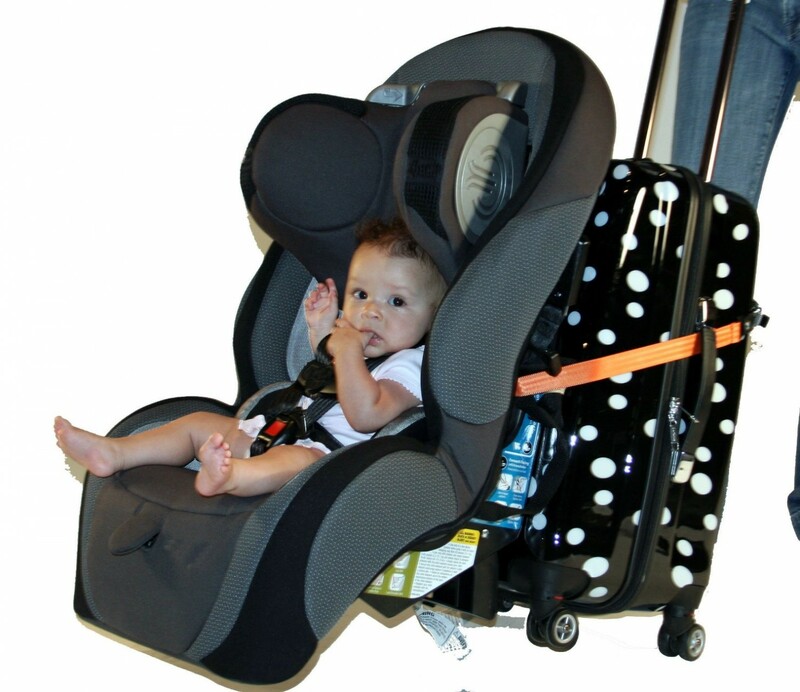 Ideally, a spare travel carseat should be lightweight (under 15 lbs), easy to install with the lap-only belt on an airplane seat and narrow enough to fit in a typical coach seat. With those criteria in mind, here are several options to consider. 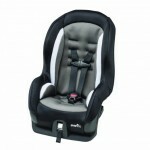 Infant carseats – no need to buy anything new as long as your current infant seat can be installed without the base. I guess it’s possible to drag the base with you on the plane but that’s just making life harder than it needs to be. 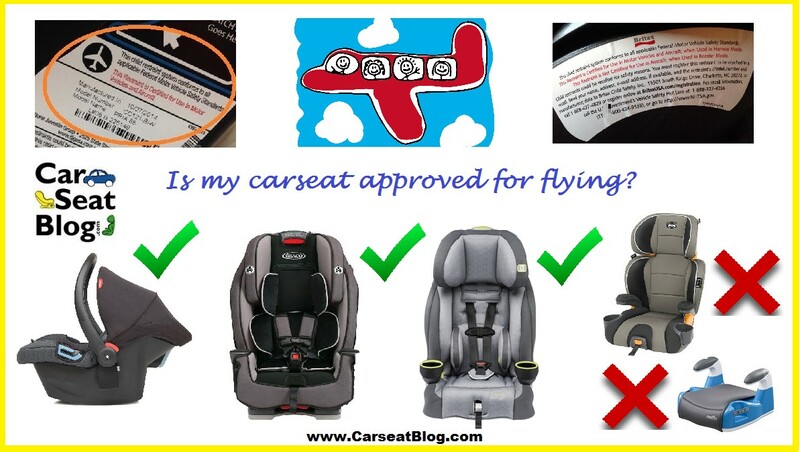 As long as your infant seat allows installation without the base (most do but there are some exceptions so make sure you know for sure), it’s easy to install the carrier rear-facing with the lap-only belt on the plane. If you’re leaving the base at home – make sure you practice baseless installation a few times so when you arrive at your destination you know how to install the carseat properly in the car, using a typical lap/shoulder belt. We have a VIDEO HERE that demonstrates my technique for quick and easy installations of an infant carseat without the base. Stay clear of unsafe gimmicky products like the ones pictured below. These products are NOT acceptable alternatives to using an actual carseat on the plane to restrain your child. Along the same lines – using a sling or infant carrier also isn’t a safe alternative for your baby or toddler because you aren’t allowed to wear your child during take-offs or landings when the risks are highest. There is a good reason for this but the details are ugly so I’m not going to go into it right now. 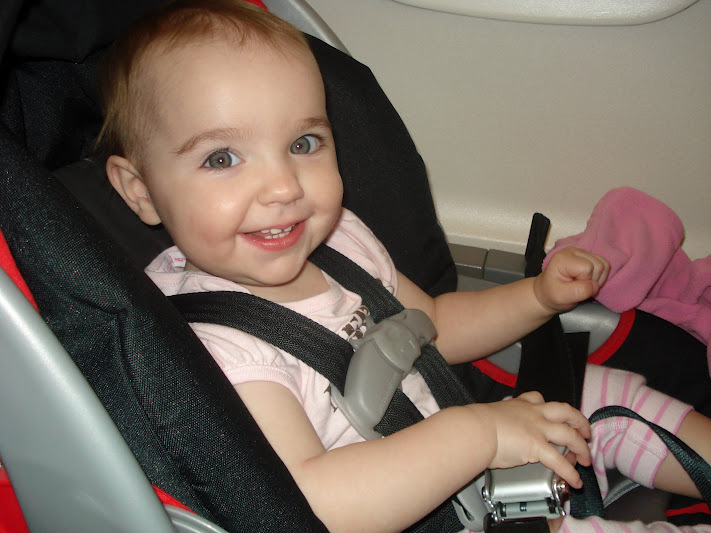 If you would like more info on why slings and infant carriers are not a safe alternative to using a carseat on a plane, please see the NTSB website. If you plan to install the convertible seat rear-facing on the plane then you’ll be best served by a seat that is fairly compact which will increase your chances of the seat actually fitting rear-facing in the space you have to work with. Rear-facing 5-40 lbs. (won’t be outgrown by height in the RF position before child hits 40 lbs.). Forward-facing 20-65 lbs., or up to 49″ tall. 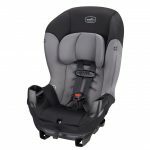 For forward-facing kids, you’ll be best served by a seat that’s lightweight, fairly narrow, with tall top harness slots and a weight limit of 50 lbs. or more. 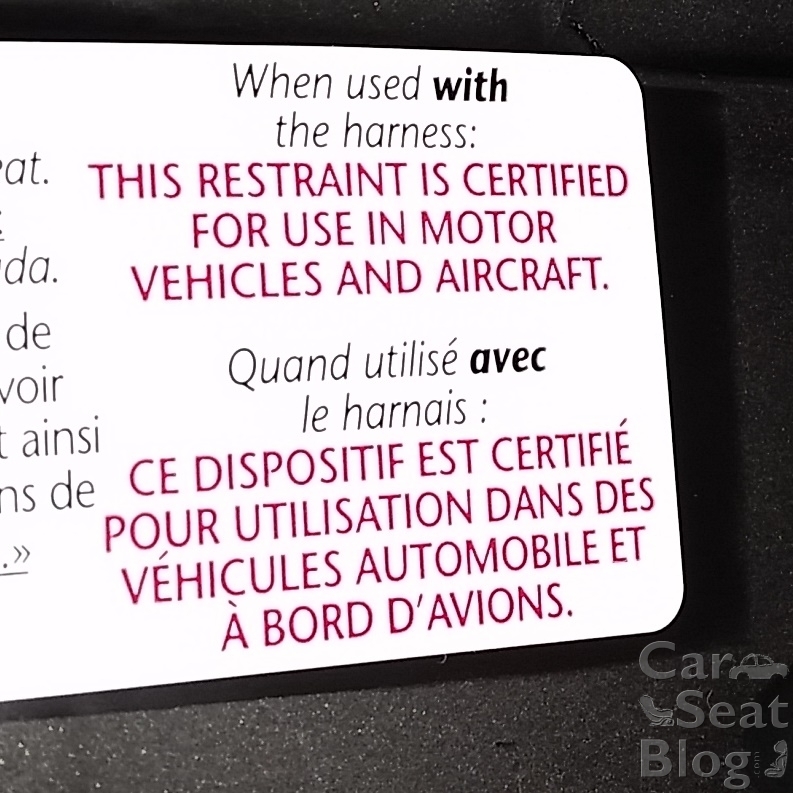 Keep in mind that combination seats (aka harness/booster) can only be used on the plane in harnessed mode. 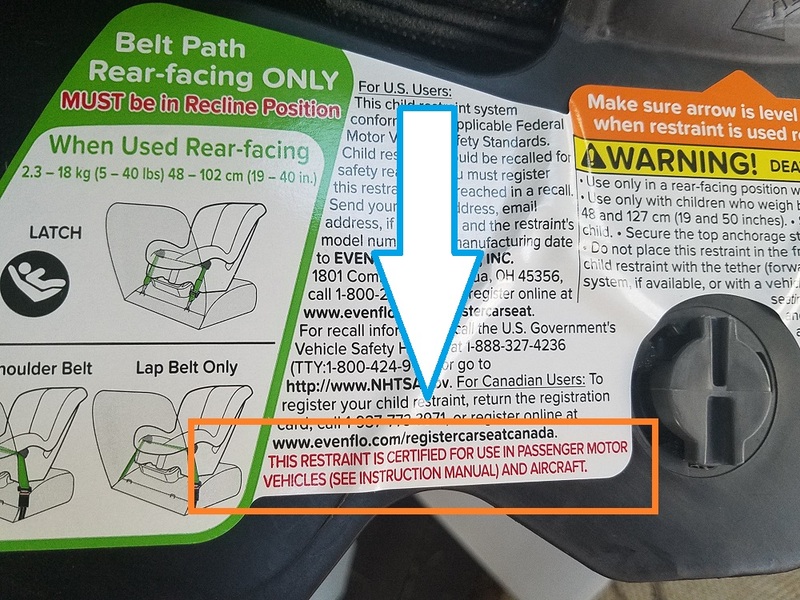 Booster seats (or combination seats used without the 5-pt harness in booster mode) are not FAA certified and cannot be used on an airplane because all booster seats require a lap/shoulder belt, which airplanes don’t have. Rear-facing 5-40 lbs., Forward-facing for children at least 1-year-old, 22-65 lbs., or up to 49″ tall. *Forward-facing beltpath is behind the back of the shell. This unique design means your FF child won’t have the metal latchplate of the airplane seatbelt in their back during the flight. A unique product for kids over 1-year-old who weigh between 22-44 lbs., and are under 40″ tall. 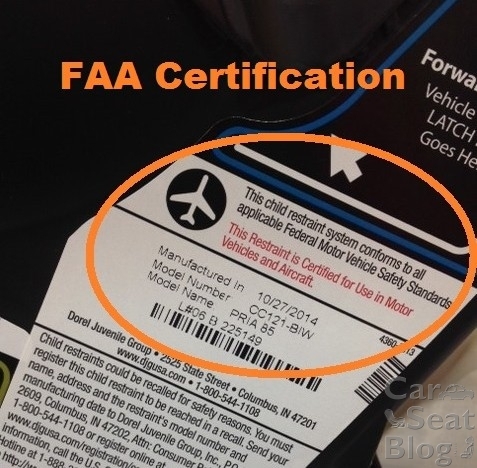 *CARES harness is certified for use ONLY on the plane. It cannot be used in motor vehicles. 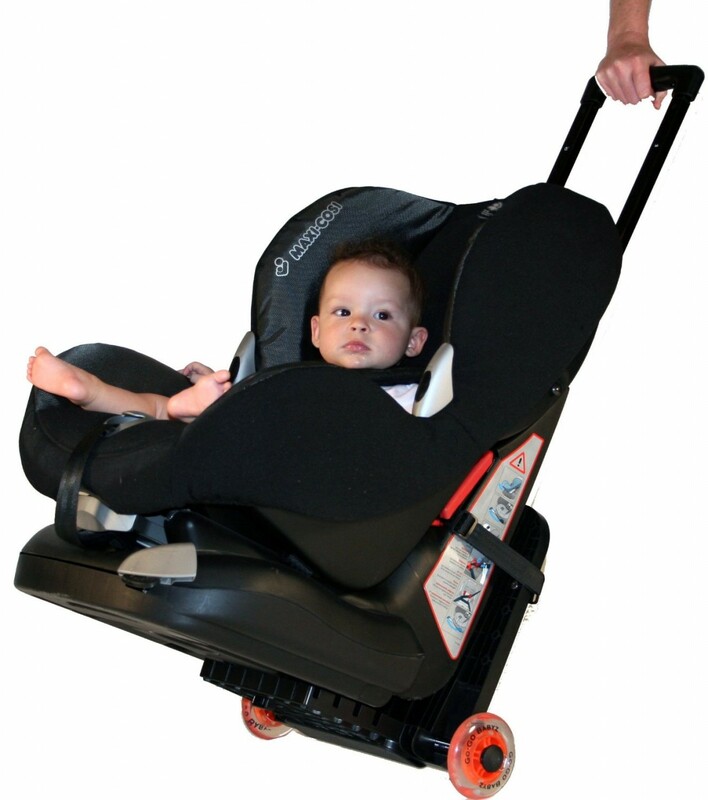 It’s very useful for situations where you don’t need a carseat to use on the ground when you arrive at your destination. We have a review of the CARES Harness here. 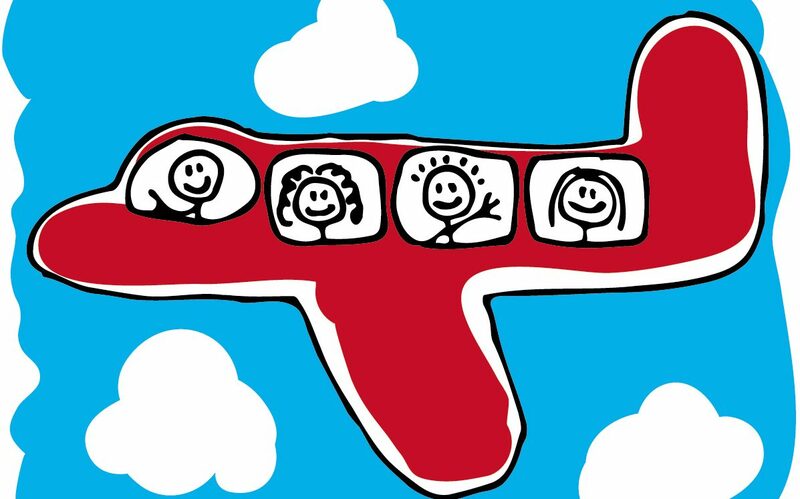 If you want to travel with your usual carseat, or just want to make it easier to travel with any carseat in general – there are many products that can help you transport it through the airport and onto the plane. Some are just generic luggage carts – other products like the Brica Roll ‘n Go Carseat Transporter, the Go-Go Travelmate products and the Traveling Toddler Strap are made specifically for a carseat. There are also carseat travel bags with wheels but obviously, you can’t put your kid inside it too. 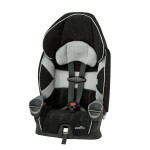 Britax, Peg Perego, Clek & Diono all make travel accessories specifically for their carseats too. Remember, only carseats with an internal harness can be used on a plane. 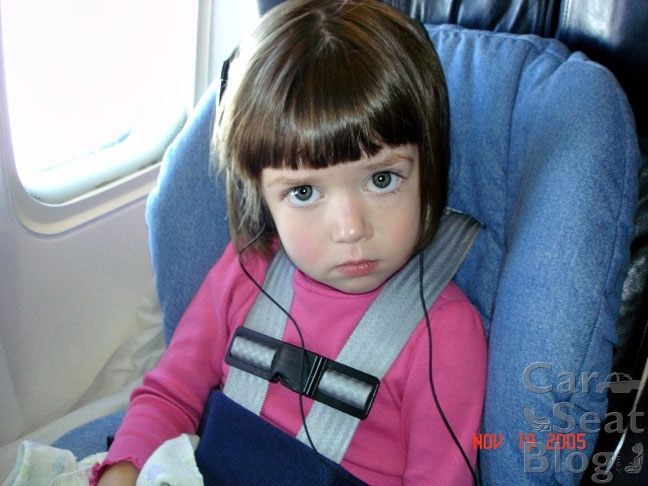 You cannot use a booster seat on an airplane because booster seats require a lap/shoulder belt and airplanes only have lap belts. If your child rides in a booster seat and you are bringing it with you, you can gate check it or bring it on the plane and put it in the overhead bin (if it fits). Flying with a Car Seat? Know Your Rights! Any idea which of these seats fit through the TSA x-ray machine for carry-on bags? My kid is 40 inches tall and 35lbs. We currently have the Gracco Contender. It is great in many ways but doesn’t fit through they x-ray machine which can delay us significantly (our home airport seems to be one of the slowest – we’ve waited 20 min for a TSA agent to inspect it). I recently purchased online the Graco Contender 65 for a car seat for our youngest (almost 18 mos) that would also be good for air travel as we will be traveling internationally as she had outgrown her infant seat. 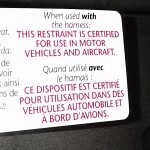 You might want to know that the sticker it has does NOT include the words “This restraint is certified for use in motor vehicles and in aircraft” That means we will not be able to use it for our flight. I would not buy this car seat if you are planning on air travel. I’ve flown many times with my son (typically without another adult). We are flying again this summer and he does have a little bit of growing room left in his Scenera Next but not much. When we used it several times as a spare this past spring he cried and complained that his back hurt (rf). I love that the Next fits down the aisle of the plane on the GoGoBabyz cart. Do any other convertibles fit (excluding Diono/Clek)? Also, I was wondering about the Evenflo Sonos. I thought it was lightweight and narrow. Such an informative website, thank you! 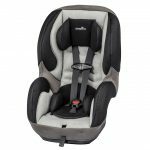 I’m wondering if anyone can help me navigate the car seat options – I live in Australia and travel frequently to the US to visit my family, usually flying Qantas, American or United Airlines. My daughter will be 4.5 months old for our first trip with her and I’m looking to purchase in Australia a converible car seat that will see us through many trips on Australian and US airlines (We use a britax platinum sict at home, which is huge). We’ll have a US car seat to use in vehicles, so I’m specifically looking for something lightweight for air travel that meets the requirements of airlines in both countries. Maybe it’s baby brain, but I can’t seem to figure this out! 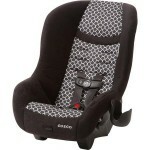 I have a Graco Convertible Milestone that I plan to use on a United flight when my son will be 1.5 years old. Do you think I will be ok to install it rear facing? Hi Heather, it is certainly possible, though also consider that it is also acceptable to use it forward-facing if you prefer. Unlike cars, where the main risk is a frontal or side impact (where rear-facing is a major advantage), the main risk in aircraft is turbulence and ejection. 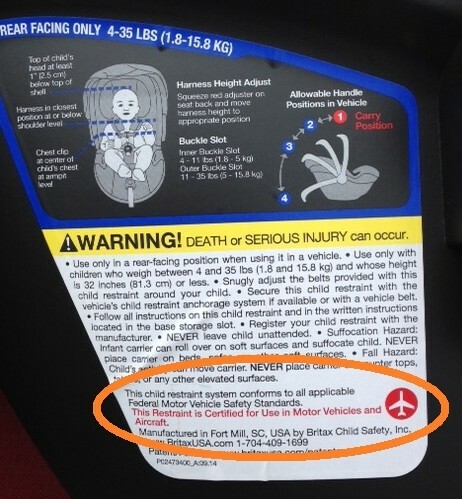 With a properly adjusted harness system, your child will be protected from this risk in either direction. 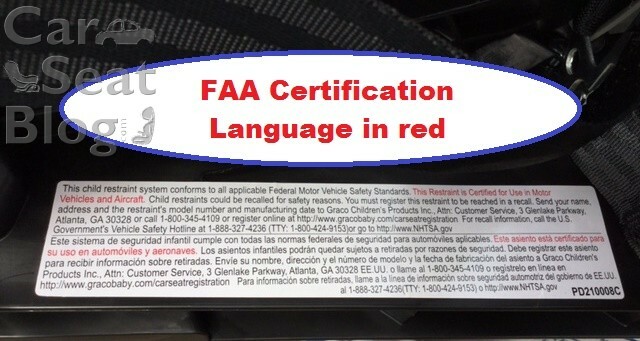 As long as they are above the minimum age and weight listed for forward-facing, you have the option to safely use it on an aircraft in either mode that is easiest for you. Hi Elise – the Tranzitions could be a good travel seat but I have concerns about its compatibility issues when installed with seatbelt. A less-than-ideal install on the plane wouldn’t bother me too much since you’re mostly protecting against turbulence. However, once you arrive at your destination you are presumably going to install the carseat in a vehicle – and that could be problematic if you need to install with seatbelt. My honest opinion is that you’re better off traveling with a different seat that doesn’t have those potential compatibility issues. However, if you know you’re going to be able to install with LATCH when you reach your destination (using a designated LATCH seating position; child not over the 45 lbs. 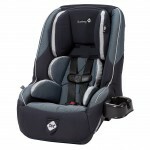 LATCH weight limit), then the Graco Tranzitions can be a good option for a travel seat. What do you mean by the compatibility of the seatbelt with a tranzitions? I didn’t realize there was an issue with them. I have one & was planning on using it on a plane soon. Carah, the belt path on the Tranzitions is relatively high up and flat on the back, so it has issues with some vehicles. Ha ignore my profie picture. I use that for my fantasy football account. Soccer injury. Carley, I think it’s probably a wash between the two seats, but the SecureKid will definitely be lighter. You should still be able to lift the armrest on the commuter flight, which helps with fitting the carseat on the plane seat. It may not help much with your comfort, lol, but at least it’ll fit. Thanks, Is there another option I am overlooking. Maybe just stick with the Britax? The weight is a pain but it is better than buying another seat. Travel with the Harmony Defender was very easy, it fit down the aisle of Allegiant Airlines (tiny puddle jumper plane) and on the seat with armrests in place! It wasn’t heavy at all, but I am use to the Diono Radian and the Britax Frontier. We put it on a small luggage cart and he actually sat in that at the crowded terminal while waiting. We are flying soon and I saw that you have flown with a Britax marathon. Was this with the arm rests up? We are flying delta. I asked the dimension of the seats in the planes we are traveling on, and it’s 16-17 inches. Which is too slim for both the seats we have. So, I wanted to clarify that you did have to put the armrests up. Thank you!!!! It looks like you are still recommending the Combi Coccoro even after the recent recall. It doesn’t look like it’s still available to purchase. That would have been my first choice. 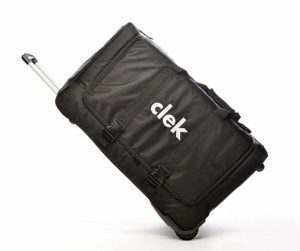 Which one would you recommend for air travel and for use in a spare car? Hi Rosalind, the Coccoro is a niche seat that is especially well suited for rear-facing in small spaces but thanks for pointing out that it is currently unavailable because of the recent recall. If you are looking for a small, compact convertible seat to use rear-facing on a plane and in a spare car – I would recommend the Cosco Scenera Next that is available exclusively at Walmart. The Graco Contender is also an excellent choice but it’s not super compact like the Coccoro and the Scenera Next. However, the Contender will also fit your child for a lot longer than a Coccoro or Scenera Next will. HTH! Does the Graco fit4me 65 have the same external forward facing belt path as the one you posted? Really tryin to find a seat with multiple recline positions for rear facing car install but forward facing airplane where the buckle right isn’t in the middle of my daughters poor back!! 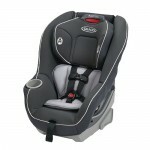 @Ashton, yes – Graco Fit4Me, Size4Me and MySize convertibles all share the same unique shell design with the closed forward-facing beltpath. We just didn’t include those on this list because they are heavier. The Contender 65 is the lightest seat (around 15 lbs.) with this feature. Weight information on each seat would be nice- I fly Cessna props, and the lighter the seat the better! This isn’t exactly helpful without widths of seats, or any info whatsoever for infant seats. 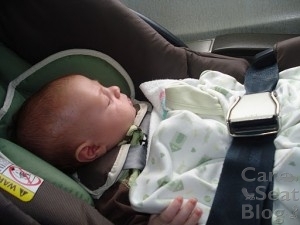 Most car seats are wider than the standard 17″ wide coach airline seat. @Sidd – Any of the forward-facing seats listed should work for your child and fit into a standard coach seat. The Maestro is rated up to 50 lbs. The SecureKid and SureRide are both rated to 65 lbs. HTH! Very useful article. Nice summary of the choices. Thanks! 1. Could you please also include the weight and width of each model for easier comparison? I went to Amazon to look that up. 2. I could not find a seat that holds up to 50 pounds, is narrow (17-inch width), and light weight (less than 15 pounds). Are there any such seats? Many airline seats are now only 17-inches wide. My kid is 37″ tall, weighs 36 pounds, and I would like to purchase a forward-facing seat for air travel. I don’t want to buy the 40-pound seats as he will outgrow them soon. We traveled in November with A Harmony Defender 360 for our 5 year old who is very tall. The harness still has a ton of room for him to grow and it has a weight limit if 65 harnessed. Its under $100 on walmart.com. He likes the low armrests on that seat compared to his Britax Frontier (he likes to sit crosslegged) and it has decent head support for a nap on a long flight. @Wendalette – you only need to worry about the recline angle if you have a newborn or a child with special needs that can’t hold their head upright. In those cases we worry that if their head flops forward that they wont be able to breathe properly. A rear-facing 18-month-old doesn’t need to be reclined very much so feel free to make that seat as upright as necessary to make it fit front-to-back. Toddlers are usually happier when they are sitting more upright in a rear-facing seat anyway. HTH! 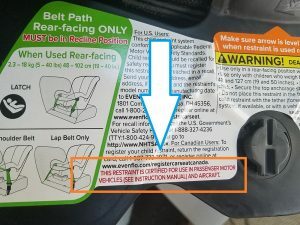 I took my 18-month-old daughter’s rear-facing infant seat (Graco Snug Ride35) on a flight and it did not fit head to toe when I attempted to install it correctly reclined! Measuring the width of a car seat is just fine, but in many of the newer planes or ones used by budget airlines, the seat rows are too close together to allow the car seat to recline correctly. Just a note to consider.